WHAT'S ON IN TUMUT! - Fly Fishing Lessons, Caves, Cycling. Fly Fishing Available All year Book Now. Tours, Packages, Tumut Fly Fishing offers Lessons, Guiding, Courses. Fly Fishing Lessons From $275.00 Inc Gear. Try It. PH Tane 69475790. Singles, Couples, Social and Corporate Groups, Families. GIFT CERTIFICATES AVAILABLE – For Fly Fishing, Accommodation, Fly Fishing Gear. Come and explore the magnificent Snowy Mountains Tumut region. Experience Fly Fishing in the Snowy Mountains Tumut area all year on the crystal clear Tumut, Murrumbidgee, Eucumbene rivers etc and the many lakes. Book a session today, try it, it’s great for all ages. Book your lesson and accommodation now. There is always something wonderful to do around the Snowy Mountains Tumut Region. Check what’s on in the Tumut Region and book your Tumut accommodation at Boutique Motel Sefton House. At Boutique Motel Sefton House we can arrange tours and experiences for singles, couples, families, social or corporate groups. Fruits Of The Region – Picking Hazelnuts, Apples, Cherries, Chestnuts, Berries etc, when in season. ” Because two mates wanted to make great beer” A visit to the brewery is an amazing experience and a great venue for events for up to 200 guests, social gatherings, or just a great place to have a cold drink and a great pizza or platter of local cheeses, fresh baked bread and much more. Visit their website: Link to Tumut River Brewing Co.
For out of town visitors – Book your accommodation at Boutique Motel Sefton House. Tansport to and from the brewery can be arranged. BOUTIQUE MOTEL SEFTON HOUSE TUMUT invites everyone to the Tumut Festival of the Falling Leaf, 27 th of April 2019. Singles, couples, families and groups are all welcome. Book your Tumut Accommodation at Boutique Motel Sefton House now so you wont miss out. What a spectacular time of year in the beautiful Tumut Region. Boutique Motel Sefton House is proud to support this event and the Gala Street Prade on the 27th of April, which runs past Boutique Motel Sefton House is a delight for the whole family. There are many more wonderful activities throughout this period and available on the Festival Of The Falling Leaf website ( see link below). Book your accommodation at Boutique Motel Sefton House Tumut, You’ll Love the experience. 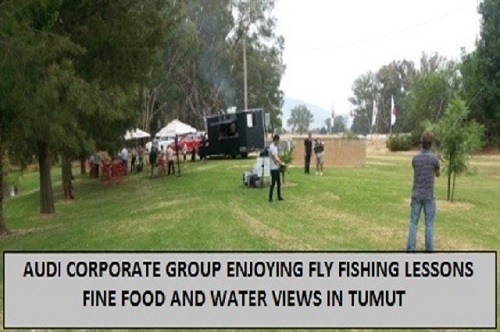 Try a Fly Fishing Lesson while you are visiting Tumut. See more. click onto the link below. Visit Tumut and experience the Festival of the Falling Leaf. There’s a whole range of events for the whole family this autumn in the Tumut Region.